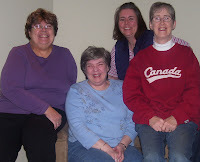 Back in February, a few of us from Southern Ontario, who meet on the newly formed Stampin Canada forum, had a real face to face get together. We had a fun-filled afternoon of stamping and chatting. It's just amazing all the things we learn from each other. Another fun filled afternoon is scheduled for this Saturday in Milton.